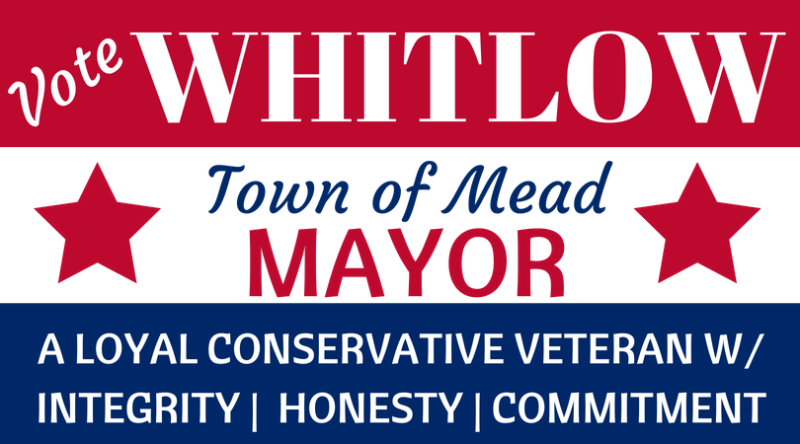 I am Colleen Whitlow and I am again running for the Mayor of Mead. Over the past four years, I have served as a Town of Mead Trustee and I have accomplished many enriching things for the community. As Mayor, I will make the largest impact by working with the other six Trustees to move the Town forward in a positive and productive manner. I have over the last four years been involved in many endeavors that shed a positive light on Mead. Mead is a small community. We as a board need to balance the small town feel with the need for revenue and manage growth to achieve what the majority of the Town residents want. As your Mayor, I will work to ensure that all voices are heard, that we account for the taxpayer funds and that we are accountable for the tough decisions that have to be made. I will work with other surrounding communities to keep the lines of communication open and moving forward. Your voice is important! You need to have the avenues available to let us know how you want your community shaped. I encourage each of you to come to the Town meetings and become involved. I am running for Mayor because I believe my skills and abilities to lead, rationalize and effectively communicate make me the best qualified candidate for the Mayor of Mead. The key to success for Mead will be my ability to work collectively within a group and thinking outside of the box. These will be key assets and that will move the Town forward in a reasonable and organized fashion. I also believe that we need to put the people and our community first. Please visit my Facebook page at ColleenWhitlowForMayor and walk with me on this journey. I look forward to working with you to keep Mead a safe community that brings us together every day.